The Star Nation Language appears in the crystal skulls, orb photos, crop circles, holograms of pure light, cymatic symbols and ancient pictographs all over the world. On August 12, 2003 a time tunnel/torus/wormhole/stargate portal opened above my head while visiting an energy vortex site in Oregon. I heard a harmonic high frequency sound while my husband, Bill, photographed the light forms. The three photographs above are in sequence. A time star gate was opened during the Montauk Experiments that occurred on August 12, 1963 in New York. On August 12, 1983 the Montauk Experiments imploded during an attempt to breach the time tunnel. Every twenty years on August 12 the time tunnel opens which accesses a portal to a stargate. See the book The Montauk Project Experiments in Time by Preston B. Nichols. On August 12, 2016 Steven Hawkings announced an space exploration project called Starshot. August 12th is also the UN International Day of Space Flight honoring the first orbit around the earth on August 12, 1961 by Yuri Gagarin, a Soviet pilot and cosmonaut. ​"The Oregon Vortex is a spherical field of force, half above the ground and half below the ground. The word "vortex" simply means a whirlpool of force, like a whirling mass of water. Especially one in which a force of suction operates such as a whirlpool or a whirling mass of air or one in the form of a visible column or spiral such as a tornado. Mary Sutherland commented: "Here is that orb that is like yours Julie - This goes to show all this type of orb is real and not a fluke of the camera." ​According to Albert Einstein’s General Theory of Relativity, it is possible to bend space using a gravitational pull by using these places to acquire and harness those extra amounts of energy, warp the distances and thus attain a burst of speed in a direction of where we want to go. According to another thought process, “whenever there is an energy emission from a higher dimension or a higher plane, the energy emission would be in form of Vortices, so Vortices and Gateways are the same thing”. Since wormholes are theoretically located all across the universe, could similar gateways be used for traveling across the universe. A blood-stained Masonic apron reportedly taken from the dead body of famed explorer Meriwether Lewis is currently on display at the Masonic Grand Lodge in Helena, Montana in the USA. "The apron, which was given to Lewis when he was initiated as a Freemason in 1797, is made of hand-painted silk backed with linen. The apron features a variety of Masonic symbols, including the all-seeing eye, the sun, moon and other signs. Several stains on the apron have been analyzed and confirmed to be blood — possibly that of Lewis." Inside the museum of the Masonic Grand Lodge on either side of the entrance way is a golden pillar crowned by a world globe just like the pillars on Lewis's Masonic apron. As I photographed the golden pillar on the left side of the doorway, a white orb appeared. These are seals from ancient Sumeria described in the works of Zecharia Sitchin. 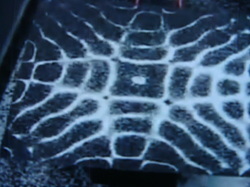 William Henry presents his theory that configurations like these represent Star Gates in his Youtube: Star Gate of the Gods. This ancient Sumerian seal shows pillars very similar to the ones in the Masonic apron above. Notice that there are numerous star configurations in the background. A stargate opening occurred over the early morning skies of Norway on December 9, 2009 the very day before Barrack Obama was to receive the Nobel Peace Prize in Oslo. Each of the aqua diamond portals in the center are surrounded by a discrete membrane of light. Every portal opens to a different local in the quantum matrix. This photograph was taken in the Judith Valley in Montana while Bill and I were accessing the knowledge of dimensional travel through the ancient pictographs painted on the rocks. A magenta portal opens at a Fairy gathering at Tizer Garden just outside Helena. 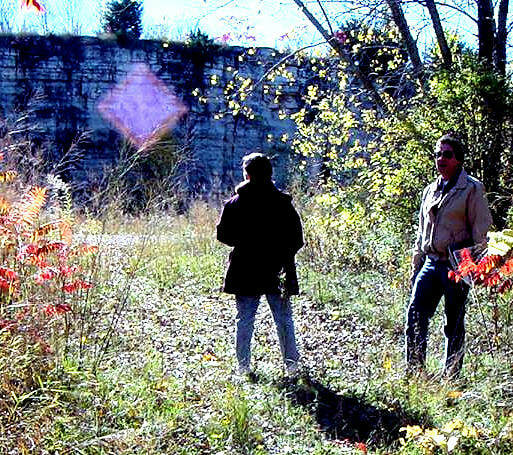 See Orbs=Crop Circles Page to view another orb photo taken the same day. "One way to cross the tremendous distances of space would be to alter the structure of space itself. This could be accomplished by modifying the space-time geometric matrix...through the modification of frequencies controlling the matter-antimatter cycles. These [cycles] control our perception of things existing in apparent space-time. Einstein's premise is that time is a geometric concept; therefore, if this could be altered, then all of the universe would become available to us at any single moment." David Hatcher Childress, Anti-gravity and the World Grid, page 129. The Star Nation Language is sound frequencies which appear as three- dimensional holograms of specific colors of light. The two- dimensional forms of these sound frequencies are used in sacred geometry, pictographs, and sacred symbols of power. The Merkaba symbol is actually two intersecting three-dimensional pyramids. In two dimension this symbol is known as the Star Of David. See more about Cymatic Sound Symbols on the Ancient Pictograph Page. Oval cross symbol formed by salt on black cardboard suspended over a speaker tuned to a high pitch frequency. 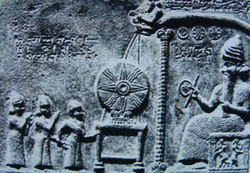 This same oval cross symbol appears on a Sumerian seal showing an Anunnaki (right) and three humans. Notice that the seal is on a pulley device which is lifting a block. 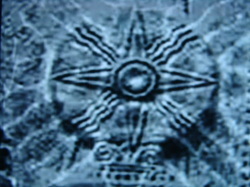 Multiple cymatic symbols are depicted in the background. This sound frequency is the key to anti-gravity technology. Perhaps that is why UFO contactees often describe a high pitch sound during the experience. A three dimensional holographic pyramid of white light forms over an ancient Tibetan bowl. A few weeks after the opening of the Star Gate at the Boulder Dolmen we again visited the vortex with the intention of accessing the quantum matrix. During a shamanic journey three of us experienced visiting star systems guided by the frequencies of the Tibetan bowls. The various frequencies emitted by the bowls resonated with the frequencies of various star systems and deep outer space opening a wormhole between earth plane and the stars. In consensus reality two hawks circled above the dolmen in a spiral pattern. Their soundings guided us back to earth plane. After the journey we photographed a hologram of a three dimensional pyramid which formed in response to the specific frequency emitted by this particular bowl. This is the Star Nation Language often referred to as the Language of Light. A hexagram of pure golden light forms over James's head as the Tibetan bowl emits a specific frequency after a shamanic journey in the Whale Dolmen. Inside the Whale Dolmen specific frequencies emitted by the Tibetan Bowls form holograms in the Language of the Star Nations. See Dolmens in Montana Page for photos of the Whale Dolmen. This gifted Star Kid manifests a purple orb from the cosmic web. A computer simulation from the Max-Planck-Institute for Astrophysics in Germany shows the Cosmic Web. "Scientists with increasingly powerful and intelligent computers capable of crunching the new data propose the Universe is constructed like an over-sized spider web. All visible material is arranged along the filament structure of the Dark Matter. These dark matter filaments are likened to the "Fingers of God". On its threads and knots, this unseen cosmic web holds seeds or pearls known as galaxies " according to William Henry. Alfred Webre wrote the consummate work on Exopolitics, in fact he coined the word. Exopolitics is the "science of relations among the intelligent civilization in the multi-verse." I met Alfred years ago at a UFO conference in Wyoming where we hung out in the lobby of my hotel and talked most of the night about disclosure. His personal history is one of the most fascinating stories I have ever downloaded. Alfred talks about Dimensional Ecology which is inter-nested dimensions including the 5th, 6th 7th and more dimensions. The third dimension which we occupy is a time-space hologram composed of multiple time lines manufactured by a higher intelligence entity we call SOURCE. The goal of 3-D existence is to integrate spirit and matter in an arena we create. In higher dimensions the design factor is light and love. The former Minister of Defense of Canada recently went public. Paul Hellyer announced that he was the first cabinet member of the G-8 to state that UFO's are as real as the airplanes flying over head. The Russian Prime Minister made a similar announcement on September 13, 2013. In his latest article on the blog Divine Cosmos titled Secret Space Program Livestream TONIGHT! David Wilcock explains, "QUITE A MIND-EXPANDING BODY OF INFORMATION. Extraterrestrials have been visiting and settling on Earth for millions of years. Functional portals have existed on earth, both natural and artificial, allowing ETs to visit earth humans at various times. These legends have since become myths of phenomena like "fairy rings". Our own people have had alliances with various ET groups for millennia -- but up until the 20th century it was only a one-way street. They visited us but would not bring us home." David Wilcock has leaked inside information from an Insider that publishes on the web under the the code name of GoodETxSG. I have read everything I can find regarding his information and find it absolutely fascinating. GoodETxSG wrote: " Earth is located in somewhat of a interstellar silk road of travel for beings of all stages of development. Depending on the time frame the groups have different levels of access to our planet and it's resources." Sacred teachings in various Indigenous cultures proclaim their origin from the Star Nations. Many legends tell of interactions with the Star People from specific star constellations. (Planet Earth). The very first EDEN which Collier describes as a type of bio-dome was located on the New Mexico/Arizona border 899,701 years ago. Established by the Ciakar from Alpha Draconis, this settlement was an experimental base which was later abandoned by these hydrogen based star travelers. I find it interesting that the Holy Grounds where I first experienced the crystal holograms during ceremonies was located close to the New Mexico/Arizona border. According to the Sumerian cylindrical seals Ninurta, (also known as Ninmah) the female Chief Science Officer of the Anunnaki, genetically engineering humans. This seal shows her with wings denoting she is a goddess and has flight capabilities. Ninmah is the half sister of Enlil and Enki which gives her equal status. Statues and documents depict Ninurta wearing a tiered skirt similar to the jingle dresses worn by Native American female dancers. "Overcome with joy, the Mother Goddess let out a cry. My hands have made it!" ERESH.KI.GAL was the Goddess of the Astronomers. She appears in an ancient Assyrian tablet coming through a Stargate. Note the triangle shaped head dress and the concentric circle symbol on her breast. The staff she is bearing is crowned by a crescent moon. When Time Began by Zecharia Sitchin. On the petroglyph panel of the TWELVE ORIGINAL ANCESTORS located in the Americas is the image of one of the female ancestors. She is shown wearing a tiered dress similar to the Sumerian Ninurta and to the jingle dresses. Her head dress is a large triangle surrounded by a circle. This is a two-dimensional depiction of a three dimensional construct of a tetrahedron within a sphere. This stained glass window located in the Cathedral in Helena, Montana is a depiction of GOD. He is shown wearing the head dress of a triangle contained within a circle. "An Assyrian cylinder seal that shows in the celestial background the Sun, the Moon (its crescent), and Venus (eight-pointed star), also depicts a small planet - Mars- separated from a larger one (Jupiter) by a straw representing the Asteroid Belt followed by a larger ringed planet - Saturn." Len Kasten writes about Exopolitics and the Iraq Stargate in a chapter of his book The Secret History of Extraterrestrials. This book is by far the best work to date on the subject. It has become my reference point. Kasten synthesizes vast amounts of cutting edge information into common language. His book summarizes almost everything about ET contact that I have read for the last 35 years, fills in the blanks, and takes it to a new level. Glowing light shield protects a spiritual warrior. Transversing stone canyons near pictographs sites in Montana. Devil's Tower was made famous in the classic movie Close Encounters of the Third Kind. We visit sacred sites to experience the energy vortex and honor the guardian spirits of the earth and stars. 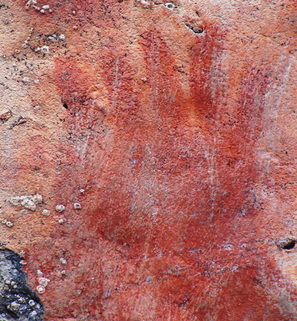 Painted on the limestone wall in the canyon above the Shaman Rock near Helena, Montana is this pictograph of a six fingered right hand. When pictographs are activated with the appropriate ceremonies they allow access to other dimensions and the knowledge contained therein. In New Mexico I participated in a ceremony to connect with the Star Nations. Corn meal was laid down on the ground as an offering. I then approached a similar set of hand prints of a four fingered one and a five fingered one. Following directions, I placed my right hand over the four fingered hand and my left hand over the five fingered hand painting. I then fitted my right knee into a concave dent and touched my forehead and then my left ear against the warm sandstone wall. Masonic temple rituals, handed down from the Egyptian tradition, re-enact going through the veil into an afterlife. After a series on injunctions, including sacred oaths never to reveal the secrets, the petitioner places right knee to the right knee of the Intercessor as the instructions are whispered into the left ear through a simulated veil. A mantra and a secret name are given as a password into the nether realm. Navajo Headman, Leon Secatero, taught that all humans are the five-fingered ones and are descended from the TWELVE ORIGINAL ANCESTORS ONLY TWO OF WHICH ARE HUMAN through an advanced technology of genetic engineering. Star Nation ancestors are three-fingered ones..four-fingered ones and six-fingered ones. 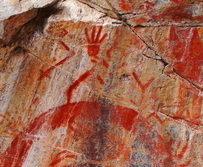 4-Fingered Being and Craft On “Tripod” Recently Found Painted In 10,000-Year-Old Caves Near Charama, India. Amit Bhardwaj, The Times of India. Four fingered one pictograph on the Missouri River near Helena. A four fingered one along the Missouri River in Montana. Questionnaires were distributed worldwide to people who claimed to have experienced UFO contact in order to determine what these people had in common. The results of the study showed that the only common element was that the contactees from age 5 to 95 all gathered seeds. Even the young children collected seeds. We have been gathering, planting and storing non-hybrid seed for 18 years. In 1995 we traveled to Tuscon to visit Native Seed Search which was an organization that preserved and grew out native seeds. We discovered that the native plants grown in the high mountains of Mexico flourish in Montana. We have been planting seeds from www.seedsofchange.com for years. We grow Hopi Orange Squash one year and Navajo Squash the next year because if the plants cross-pollinate they become hybrid. Mandan corn grows well here in Helena. We have success with Old Indian Woman and Hidsaka beans. Leon Secatero gathered the Elders from Indigenous tribes all over the world to perform the Changing of the World ceremonies in 1998 in New Mexico. In 2008 Leon came to Helena. During his stay with us he would often show us a leather medicine bag that he wore around his neck. The bag was filled with seeds. He would say "Do not go anywhere without your seeds." The first day I met Leon at his home in New Mexico he took us to the Holy Grounds. He spoke of the vital importance of storing non-hybrid and native seeds to "grow the Sixth World". Agra-business maintains their monopoly and control over our food supply. A group gathered in Helena February 26, 2012 to view the movie The Economics of Happiness (See www.theeconomicsofhappiness.com). This documentary/movie explored the crucial state of the planet and the necessity of growing our food locally.